This process does not really “install” the plugin, instead it just registers the plugin information as an extension in vCenter (info on that here). You can see the extension info registered in the vCenter, which includes some basic information (version, vendor etc.) and a URL to actually download the plugin files. At the next login to the vSphere Web Client, vCenter will download the zip from that URL and unzip to the correct location, allowing the plugin to load for you. At login the version will be checked each time, so if you upgraded it will download the new version and update the files. Version 2.0.9 of the plugin used TLS 1.0 in general to communicate to the FlashArray so if you upgrade Purity to 4.7 it will stop working until you upgrade to 2.0.10 or later. When vCenter tries to download the new zip file for 2.0.10 or later, it will try to communicate with the FlashArray over TLS 1.0, which the FlashArray will block. So the final install step will fail and the plugin will not appear in the Web Client home inventory. [2016-04-18 23:59:11.763] [ERROR] vc-service-pool-10 70000087 100003 200001 com.vmware.vise.vim.extension.VcExtensionManager Package com.purestorage.plugin.vsphere was not installed! Use a temporary location to host the plugin zip file to use TLS 1.0. One option to getting the plugin installed without too much hassle is to manually install it. You still need to run the installation process from the FlashArray GUI to register the plugin first. This doesn’t change. This is the part that registers the plugin as an extension and needs to be done. NOTE: This example uses the 2.0.10 version of the plugin, but the same rules apply for newer versions. What you do need to do now is to place the plugin files manually on the vCenter. The first step is to get the zip file for the 2.0.10 plugin, this is going to be stored on your FlashArray. The IP will be different for you, or use the FQDN of your FlashArray. The rest of the URL will be the same. This will prompt you to download the zip file. Now copy this to your vCenter (SCP if you are using the Linux Appliance or copy/paste or whatever for Windows). 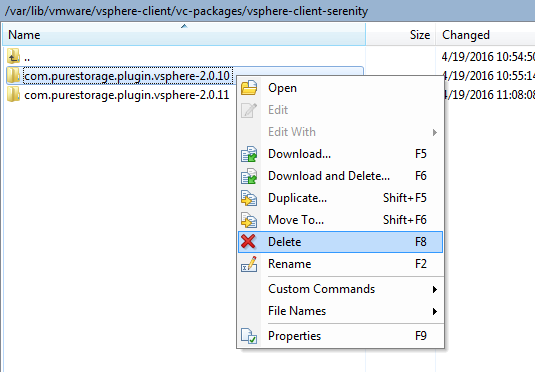 Note that this directory may not exist so you might need to create it, in a vCenter with no plugins often the vc-packages and vsphere-client-serenity folders need to be created. Check this KB on how to fix that. Or this workaround which I think I prefer. Then you are done! Log back into the vSphere Web Client and the Pure icon should appear. You need to restart the Web Client service at this point, it never seems to show up after manual installation without a restart. You don’t need to restart vCenter–just the Web Client service. A Windows install of vCenter is a bit different than the Linux flavor of vCenter when it comes to installing plugins. Note your drive letter might be different than what I have below. To install the plugin you need to create the purestorage directory. Do not copy the whole directory including the top level folder called com.purestorage.plugin.vsphere-2.0.10, instead just copy the contents of the directory com.purestorage.plugin.vsphere-2.0.10. Once they are copied, restart the vSphere Web Client service (takes a few minutes) and then you are good to go. So if this is not a fresh install of the plugin (which for most probably isn’t) you need to upgrade likely. A manual upgrade is pretty much the same process as a manual install with an extra step (deleting the old files). Log into your FlashArray with the newer plugin version and run the standard upgrade process. Now copy the new files to the appropriate location and directory format as the above relevant section indicates with the newer version number and delete the old files. Only delete the files for the Pure Storage plugin, so you don’t affect other plugins! 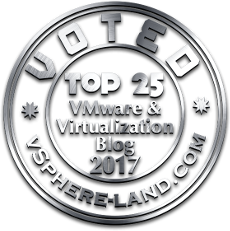 Restart the vSphere Web Client service and you are upgraded! No manual installation required! Yay! So you need version 2.0.11 for vCenter 6.0 U2 and later, there is no workaround (that I know of) to get earlier versions of the plugin to work, you must get version 2.0.11 of the Pure Storage Web Client Plugin. Currently, this can be obtained from support (just ask, they will get it to you quickly). We will bundle it in Purity in upcoming release. I’m in following Situation now. 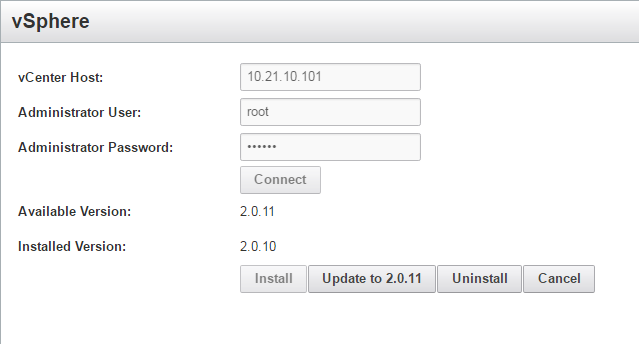 In the pure Administration it says available plugin 2.0.10, installed plugin 2.0.10. We are running vCenter appliance 6.0 U2. What to do to install pure plugin 2.0.11? I already uninstalled Version 2.0.10, installed it again, then copied Version 2.0.11 to the appliance. after restarting the web Client i dont see a plugin installed. on the appliance are the files for Version 2.0.10 and 2.0.11. What did I wrong? One more Information. under https://vCenter/mob Version 2.0.10 is registered.